Does your city need more weddings? I’m not talking social engineering here. 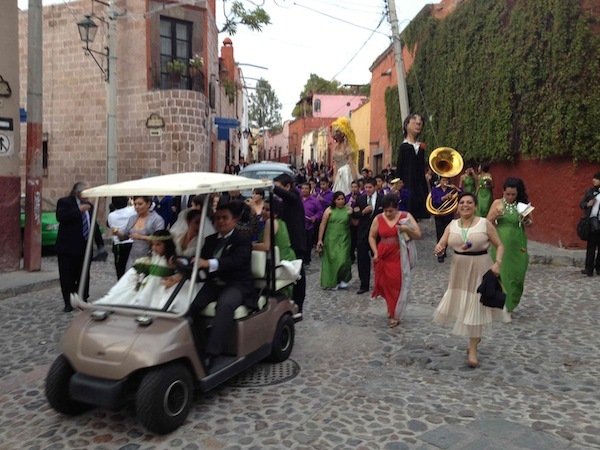 But wouldn’t your town be livened up if more wedding parties took to the streets, literally? 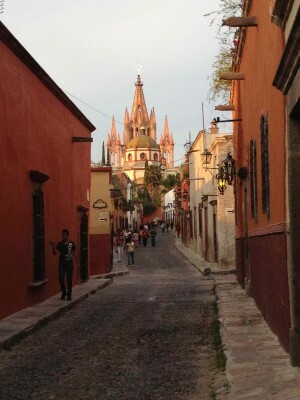 It’s a common experience here in San Miguel de Allende, Mexico. 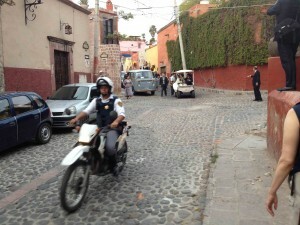 Walking near Parque Juarez recently, we noticed a police motorcycle had traffic stopped. It doesn’t take much to create congestion on the narrow San Miguel streets – but there is little concern about slowing cars. Life here takes priority over the mere movement of vehicles. 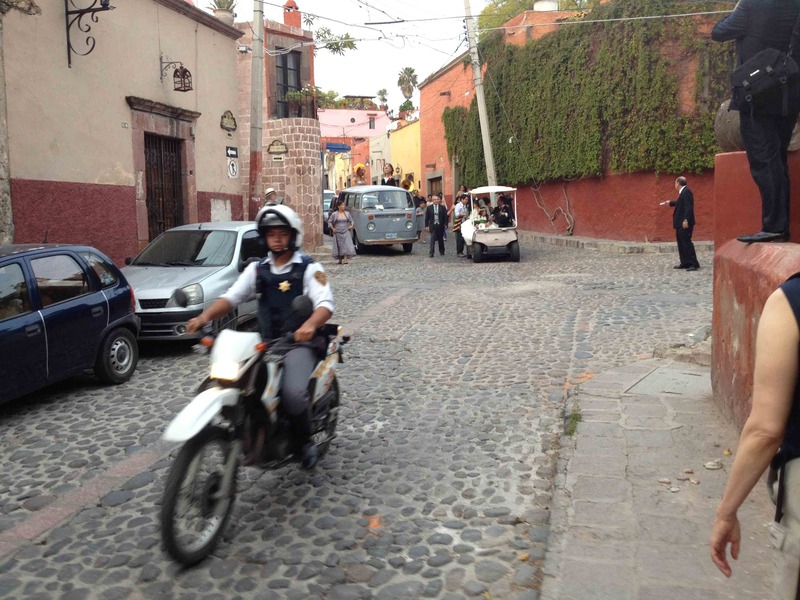 Down the street, behind the policeman, came a wedding party, no doubt having just left El Parroquia or one of the other churches in the historic centre of town. The wedding couple rode a golf cart. The bride and groom lead the party. Following them were musicians, puppet characters, elegantly dressed wedding guests and a donkey. 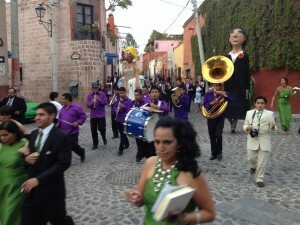 My wife was amazed to see the women navigating San Miguel’s undulating cobblestones in high heels. We stood aside to let them pass. A private celebration becomes a shared, public celebration. A man from the wedding party came over to where we stood against the adobe wall on the narrow sidewalk and offered my wife a little ceramic mug of drink. Tequila, of course. He was the bride’s uncle, he said, and wanted to share the celebration. My wife happily downed the shot – and was told to keep the shot glass as her memento. There was no road rage from impatient motorists. Only clapping and shouts of congratulation. My wife was certainly glowing as we continued our walk up the street. So, can such joy for life be translated onto city streets elsewhere? In urbanism circles, we talk about the design and ‘programming’ of public space, including streets. Programming often involves special events like festivals. But why not weddings? What do you think? Wedding parties often travel modest distances from a church to a hotel or banquet hall for a reception. What would it take for more of them to parade a few blocks through downtown and share their joy? Nice post! The cool thing about these kind of celebrations are their authenticity. Sometimes festivals can seem contrived or are just badly run. Spontaneously running into a wedding or a birthday on the street can be a memorable experience. It certainly sends the right kind of message. On any given Saturday in Sydney there are frequent bridal party near-collisions as various wedding parties walk to and from photo shoot locations around Circular Quay (with the harbour bridge, opera house, and botanical gardens nearby) – it is a lovely reason to have to pull over (as a pedestrian!) and makes for great people watching.